This stylish horn of plenty takes its purpose very seriously, overflowing with more gifts of the season than any cornucopia you have seen before. 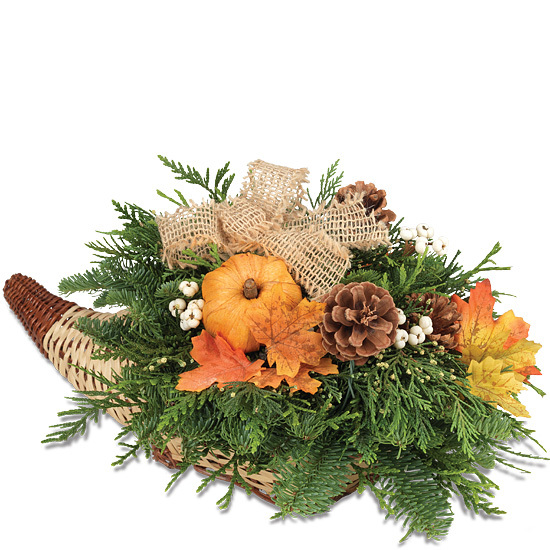 Fresh noble fir, Western red and incense cedars are interwoven with Lodge Pole pinecones amidst a host of faux tallow berries and maple leaves. A raffia pumpkin in orange and a bow of natural burlap add the final touch of seasonal elegance to the woven wicker basket, its horn shape flat on the bottom for easy display in an entryway, on a sideboard, or as a dining table centerpiece. Our fresh designs are originally produced with extra elements so slight shedding is normal. To keep your display fresh for the longest possible time, you may moisten the floral foam and/or mist it occasionally with water, taking care not to wet the faux components in the cornucopia. The greens will soften in color as the centerpiece dries. As the components of this centerpiece are accustomed to colder weather, it can also be displayed in a covered outdoor area, away from the elements.